Every story needs an angle. Something to hang the narrative off of, to give depth, substance and a false sense of being a better writer than you really are. At the moment, I'm angle-less. Let's just see how this goes. I'd suggest getting a cup of tea, maybe a biscuit (choc hobnob?) and a comfy chair. This could take a while. We left Newbury at 5pm on Friday, with Darren driving his giant bike-mobile. After picking up Becky and Caron at the station and dropping off Becky's folding bike we joined the summer holiday traffic oozing up the motorway to "the North". I'd had a moment of amusement when Darren realised how long it would take to get to the B and B but this was tempered by realising myself. Sat Nav says... 10pm arrival. 11pm. We arrive at the B and B. We were greeted by a very friendly lady, asking if we wanted tea to go with our wine that was already waiting in the rooms. Not only did we have wine, but we also had slices of chocolate toffee crispy cake and little chocolates too. The lady also helped us with our kit and let us put our bikes in the beautifully decorated hallway! A big thumbs up to Fleatham House. Morning, and the usual rush of breakfast, making energy drink, packing camelbaks, putting on sun tan lotion (risky, I know) and checking the GPSs. We managed to get out by 8am and rode the 1km to the beach. 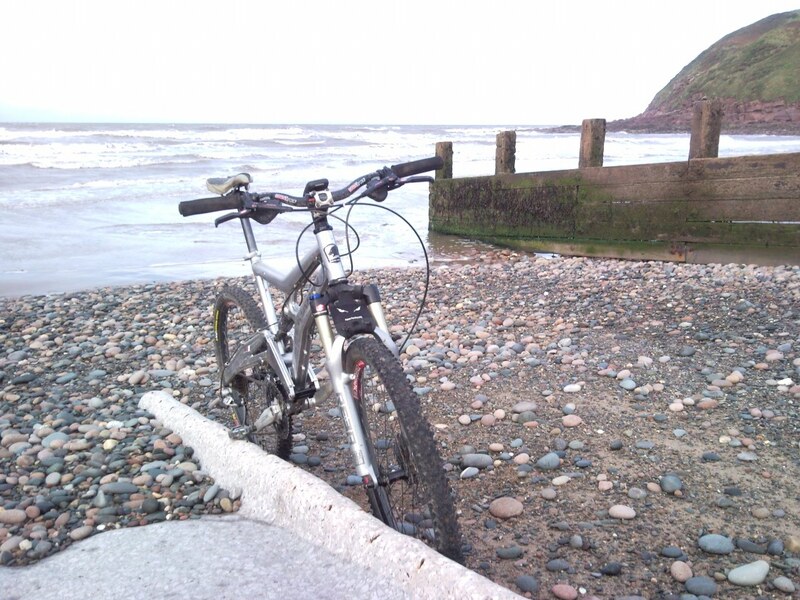 Here is my bike at the beach. There is a photo of Darren and I, complete with bikes, but I don't want you getting too excited. You may notice that my bike is leaning against a bit of a ramp. This is the slipway which I walked back up to the path. Darren rode up, stating that he was going to ride the whole way. Remember this. 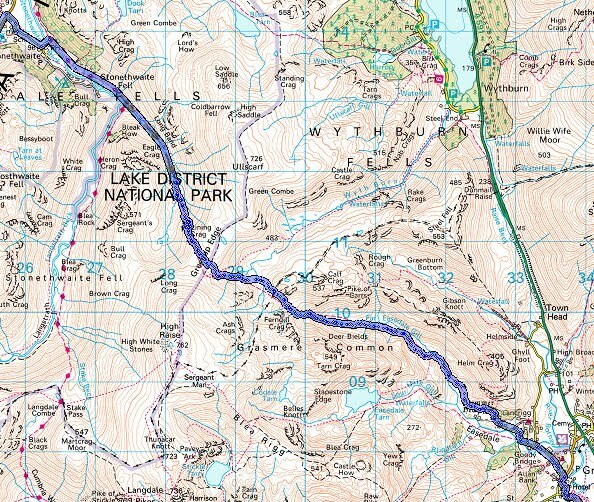 The first part of the route was on the road, before turning onto a cycle track. We had a tailwind, almost sunshine and were feeling pretty confident at getting to the lunch stop (Ambleside) by about midday. Remember this also. The first section of off-road arrives. Across Banna Fell, Whiteoak Moss, Mosedale then down to Crummock Water. You don't get names like that round Newbury. You also don't get tracks that disappear, knee deep bogs and suicidal sheep - including one that seemed to be stuck upside down. Not being well versed in sheepish ways we didn't know if this was normal or not, so felt it best to leave it as it was. Better that than getting savaged. I walked quite a lot of this section. I'd say that Darren walked too, including a stumble caused by his front wheel disappearing up to the hub in a puddle, but of course Darren was going to ride the whole way. The track next to Buttermere was surfaced and quick, but also full of walkers. On this ride we soon learnt that walkers meant we were near civilisation, and soon enough we arrived at the road by Buttermere Fell. Brilliant, we thought. Road! Road that goes up! At 25%! Honister Pass. Actually, it was fine - we were on mountain bikes so just spun our way up. It was at this point that Darren pointed out that his knee was a bit hurty, and had been since the morning. Still, sitting and spinning wasn't too stressful on it. The descent was fun, dodging the traffic and more sheep. A few more roads and we arrived at the bottom of the big climb of the morning, Greenup Edge. Hmm. Lots of those funny red lines, quite close together too. Still, Darren's going to ride all the way. I started walking. It was steep, rocky and quite hard going. It also went on... and on... and on. Without looking round (to avoid having to watch him ride it all like a mountain goat on a bicycle) I asked Darren how it compared to Trans-Rockies. Quite similar, apparently, although he walked that. We got to the top. Well, we thought it was the top. Thing is, the path seemed to end and we were surrounded by what I can only describe as "minor cliffs" on all sides (except backwards). Then we spotted the path. It was more of a scramble than a walk. Well, more a climb in places. Up a waterfall. With mountain bikes on our backs. Greenup Edge is not a bike route. Strangely, we were still enjoying ourselves. The sillier it got, the more it made sense. A cross-the-country route should involve some hike-a-bike. Just not this much. It was now about 12:30. Lunch at 12 was looking increasingly difficult, unless it was the next day. Once over the top the track did the comedy disappearing act again, but we managed to find our way across the mushy bits until we found something that could loosely described as a path. Or a stream. A stream would be an equally good word. We scooted/ran/walked/climbed/swam and even rode downwards, confusing some walkers who couldn't fathom how we had got across with bikes. Truth is, we were a little confused about the whole event too. We made lunch at 15:30. Lunch was good. There were chips.